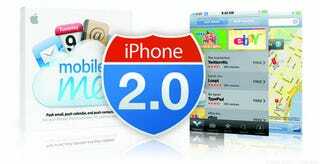 Click to viewThe iPhone 3G may be here, but what we're really excited about is the iPhone 2.0 software update. Only some people really need faster browsing and slightly better location services, but everyone can use the new features in the OS. Now that we've gotten chance to go through all that updated functionality-as well as a good chunk of apps, MobileMe and Exchange-we've only got one question left. Is iPhone 2.0 so good that you don't even need to upgrade to an iPhone 3G? It depends. But if I was forced to choose between an iPhone 3G barren of apps and the slower original with them, I'd go for the apps. Although the updated OS features such as Exchange Sync and MobileMe are only good for a portion of iPhone users, the addition of the iPhone App Store makes the phone almost infinitely expandable, allowing third-party software developers to cover up whatever holes (MMS, voice dialing, instant messaging) the default OS has. Let's start with what's new in the operating system. Like Jesus saw in an earlier version of 2.0, it contains big features like Exchange support, the App Store, parental controls, CISCO VPN and mass email deletion. There are also little features that make your general experience a bit nicer if you've been used to the old firmware versions. • "Contacts" application. This is basically the "contacts" portion of the Phone app split off into its own. Both it and the original phone contacts have the ability to search for entries by directly typing their name in via the search bar. Why do we need a second app that does what we can already do in the Phone app? • Multiple "Calendars" differentiated on the phone. Previously, iTunes merged all your iCal calendars into one big calendar on the iPhone. When you created a new event, it would go into one default calendar of your choosing. Now you can see exactly which calendar what event belongs to by the little colored dot, plus you can insert events into the correct cal directly on the phone. • Better password fields. Instead of displaying all stars (*'s) when you're typing into a password field, the iPhone now displays the last letter you typed in clear text so you know if you've made a mistake, rather than having you erase and start over when the wrong password is rejected. • When triangulating your position on Google Maps, the locator circle zooms out further than before, throbs, then zooms in as it figures out your location more accurately. Interesting change, but we're not sure if it's any more accurate than before. • The calculator switches to scientific when you go to landscape mode. • Photos are now geo-tagged using location services. • A global option under system prefs for turning on/off push. So far Exchange, Yahoo and MobileMe (including .mac addresses) have push email capabilities, with Google and your other random email addresses are still lagging behind with manual fetch. • A global location services switch can be turned on to signify that you want location in your apps. But the problem is, each individual application still asks you to give permission to use your current location. We wish there was a way to just grant blanket permission to everything. • International keyboard support. Once you have more than one keyboard language activated, there's a globe icon that shows up next to the space bar on your keyboard so you can toggle languages. The foreign language support seems really great too. We started typing a word in Chinese, and the phone kept guessing what subsequent word we were going to follow it up with. Most of the time it was right. And now the big three. App Store: You know the App Store is going to bring lots of applications for you, and the ones we've seen so far are already of higher quality than most of the stuff on Installer.app. Stuff like Super Monkey Ball, Dice Game and the Remote App are indicative of the level of quality you're going to see coming from the store. Add to that future GPS applications, voice dialing and other semi-OS level software suites and you've got the framework for building a fantastic phone. On the other hand, the background notification service so you can receive AIM messages while doing something else isn't coming until September, so some apps are kind of crippled until then. We've also noticed that syncing your iPhone when you've got a lot of applications installed takes a really long time. A lot of this seems to be from backing up the apps-which are installed, not just transferred-so be aware of the new increased sync time. MobileMe: Because of its $99 a year price, MobileMe is only really useful for people who never sync their phones, have multiple computers to keep in check or need other people to be always aware of their schedule. What it does do, it does very well. Push Email is so fantastic that it's a BlackBerry killer. Live push syncing of contacts and calendars makes it transparently easy to keep your stuff always in sync between your desktop and your phone. As strange at it is, some people never sync their iPhones manually. We won't go into too much depth over the other MobileMe features, since you're pretty much familiar with it from its .Mac incarnation, but you're getting a rich web-based portal with your email, calendar, contacts, photo hosting and web disk as well as the ability to sync files between different Macs. The bonus for business users who have to use Exchange is that with MobileMe, you can keep both your Exchange contacts and your home contacts (synced through MobileMe) on your phone. If you don't have MobileMe, you can only have either Exchange or your own contacts. Exchange: This is the one big feature (beyond better VPN security, the ability to deploy enterprise apps internally and remote wiping) that will get the iPhone into business use in a big way. Although we don't have Exchange servers at Gizmodo, we did test it with the free Exchange account at mail2web, and everything worked as it should. Emails came in pushed and contacts/calendar entries synced on the fly. There are free exchange servers like this one around the web if you don't want to pay the not-so-terrible $100/year for MobileMe. Between the iPhone Apps and OS updates, the iPhone just got a whole lot better. But there's still features missing from iPhone 2.0 that we still want to see-stuff that can only be added by Apple. Video recording, which should technically be possible with the correct drivers and right encoding and acceleration software, is one of the big ones. There's also over-the-air Wi-Fi syncing of your music library, a feature the Zune 2.0 has had since last year. Cutting and pasting is yet another OS-level feature that needs to be integrated into every application that contains text. We're sure you can come up with a few features you really wanted in this version. Even if you're not getting an iPhone 3G, original iPhone owners and iPod Touch owners are getting a significant upgrade in functionality for a free (or nominal) price. In fact, if you don't need the faster speeds or slightly better location services that GPS brings, you're fine with sticking with the first gen. If you're still getting a new iPhone, you're getting a fantastic OS upgrade along with it. Update: We've learned a bunch of stuff since the review a week ago after heavily using the iPhone 3G/iPhone 2.0 this past week at E3. • A lot of the apps aren't incredibly stable. Developers only had a couple months of play time with the platform, so stuff isn't nearly as stable as it could be. Most of the time when an app crashes it won't take down the system, but we've had our share of having to hold down the power and home buttons simultaneously to hard reboot. • Apple hadn't really allowed developers to chat with each other because of the NDA, so they couldn't share notes on how to do this function or that function in a smart way. So, the quality of apps will go up starting now. • Only about 20% of the apps are good. I'm not sure what people were expecting from the iPhone App Store, but like any open or semi-open development platform, there's going to be a lot of garbage apps that either aren't well made or are so niche that only a handful of people would use them. This is like that. • Because Apple has to hand-review every update to the App Store, it takes forever for developers to patch their software. Many apps like NetNewsWire have a handful of point-releases that fix bugs already done, but are waiting on Apple to approve them. • The "backup" portion of a sync takes a really long time if you've just made any changes to your applications. iTunes is taking a snapshot of your phone for restoring purposes (you get all your apps back when you do a restore). So keep that in mind if you want to do a really quick sync and get out the door. • There's a new URL trick as well, adding various domains automatically to the end of your URL instead of just .com. • Safari also shows YouTube clip links so you don't have to go into the YouTube app manually and search for that video you wanted to see.